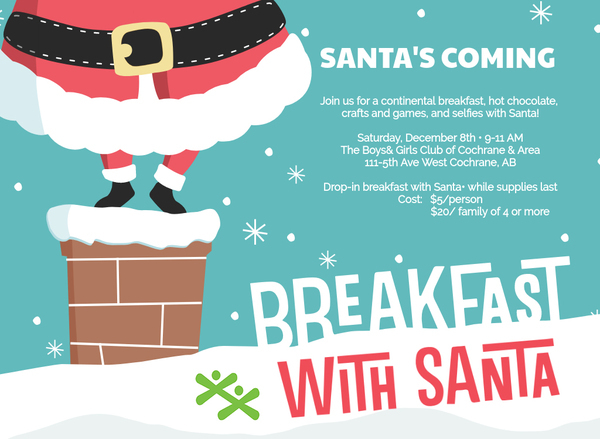 Stop by our club Saturday December 8, 2018 from 9 a.m. to 11 a.m., and enjoy a delicious continental breakfast with Santa! There will be hot chocolate, Christmas themed crafts and games, selfies with Santa, and special guest Mrs. Claus! Cost is $5 per person or $20 per family of 4 or more. We accept cash only payment upon entrance. A special thank you to The Venue Bar & Grill, and The Kinkonauts for coming out and making us laugh harder than we thought possible! We also wanted to thank all the businesses and individuals who donated items for our silent auction, we appreciate your support! As well as a BIG thank you to everyone who attended, Night at the Improv Fundraiser wouldn’t have been a success without each and every person there! Rumble at the Ranche was a success! 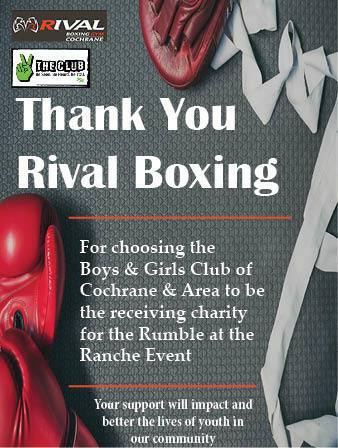 A HUGE THANK YOU TO Rival Boxing Gym Cochrane for choosing us to be the receiving charity for the evening. We were very impressed to see how many people came together for a fun night and cause! Special thank you to all the BGCCA youth volunteers for helping make the night a great success. We have shared a special night and now special bond to boxing, Thank You! Amazing things happening with Play Days! Play Days has some exciting news to share. One of our gifted day home providers, Jessica Walker, was the recipient of an Child Development Professional Alberta Award of Excellence in early December following a nomination from our agency. This is an incredible achievement and we are so pleased to have such an exceptional caregiver as part of our team of providers. If you see Jessica around the office (likely with a little brood of cuties) please take a minute to extend a congratulations! The Boys & Girls Club of Cochrane & Area is excited to offer sponsorships for the Out of School Program fees! Check out our BGCCA Sponsorship page for more details! We completed our draw for the WestJet Cares for Kids Raffle on July 14th and Amanda from Calgary was the lucky winner of 2 round trip tickets to anywhere WestJet flies!! Congrats Amanda and a big thanks to everyone who participated!! This year was a record year for funds raised from our annual raffle and we couldn't have done it without each and every one of you!! 2018 Best of Cochrane Awards! 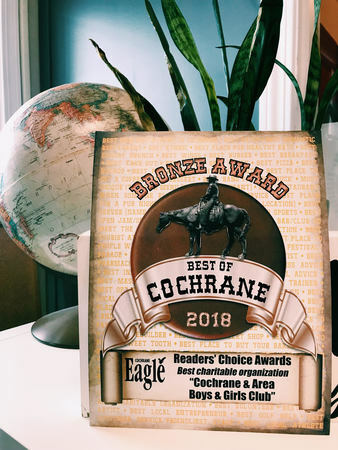 We were awarded the Bronze in the Best Charitable Organization for the 2018 Best of Cochrane survey. Thanks Cochrane for your continued support!! We've partnered with COBS The Quarry in their End of Day Giving program. Each Wednesday evening this summer, we'll be picking up COBS products and using them for our healthy snacks initiatives and distributing them to our families! Did you know that tickets to all sorts of events are available for kids & youth in the City of Calgary? We are a Kids Up Front partner! Kids Up Front works with registered partner agencies to facilitate experiences for the kids that they serve. Kids Up Front (www.kidsupfrontcalgary.com ) provides tickets to events (Hockey, Concerts, Performances etc.) to Boys and Girls Club of Cochrane and Area and other non-profits around the City. The agencies agree to strictly abide by Kids Up Front policies in selecting children and youth who not otherwise have the opportunity to attend events in the Calgary area community. If you are interested in accessing these ticket opportunities or wish to volunteer to bring Youth to events (ticket for you also provided) please contact Laura at lharper@bgccochrane.ca.